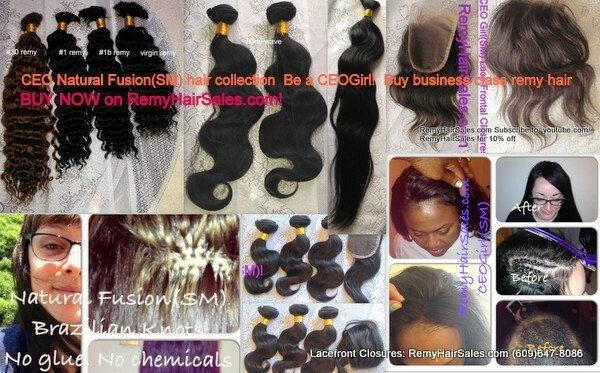 Welcome to CEOGirl(sm) virgin hair extensions on RemyHairSales.com: business class virgin hair. One of the finest A-list stylist recommended virgin hair- our hair is reusable! Soft and natural virgin remy, and remy hair are each sold by the ounce. Available in bulk/fusions for braiding, fusion, and Brazilian knots styles, and also weft/weaveon for sewins and glueins. When dyed to different colors the integrity of this hair stays intact. Hair supplies such as hair extension Brazilian knot thread. Elastic thread/ string for Brazilian knots hair extensions. FedEx, UPS, USPS shipping options- Same Day, or Next Day after processing order. KNAPNots(SM) Brazilian Knots Training- Online, And Exciting Locations! To add more to cart: change quantity in shopping cart from "1" to 2, etc. To buy other types of products click on "continue shopping". Ordering problems? Call/email for an invoice instead:(609)647-8086. If busy please leave a return call phone number. We will be glad to get back to you. Do you want to get into the hair industry? Are you a beginner? You should always add new in demand techniques: KnapNots(SM) Brazilian knots, CEONaturalFusion(SM) Brazilian knots, sewins, treebraids, and more with a simple click of a mouse! Take the first step to order training: click the order button and checkout with confirmation. Or click 'order', then select Paypal BillMeLater(R) at checkout to pay later. Boom, done! Invoiced payment arrangement currently available also. For braiding text with your name to: (609)213-7985. CEOGirl(SM) virgin hair collection is a leader in high grade hair extensions, training, and training supplies. Our hair products and superior brand of Brazilian knots hair extensions services lasts much longer. Our hair is thoroughly cleaned and showroom ready- available for sale. We offer 100% virgin human hair for all of our hair extensions. We are your modern day luxury pure virgin (undyed) and remy- (custom dyed virgin hair per your selection) hair sales destination. Our goal: offering virgin, longer lasting, and high fashion hair extensions! Colors available. RemyHairSales.com is proudly hosted and is a collaboration of CEOGirl(sm) virgin hair extensions, a highly sought after re-usable product. Business development by www.Youtube.com/RemyHairSales: Eurasian hair extensions. Malaysian hair extensions. Peruvian hair extensions. Indian hair extensions. All available on RemyHairSales.com. Thank you for visiting and for your order- CEOGirl(sm)! Copyright 2011-2018. RemyHairSales.com, CEOGirl(SM), CEO Natural Fusion(SM). All Rights Reserved.